A landing spot for many immigrants and a vast city rich with Canadian history, Toronto is home to one of the world's most diverse communities. Just a little over an hour away from New York City by plane, and a bit closer to Detroit, Toronto has fantastic shopping, whether you're looking for retro bargain finds or upscale couture. The capital of the province of Ontario, Toronto can be a gold mine for visiting shoppers, but beware of two things: the sales tax, and the weather. Mentally tack on about 13 percent to the price of clothing, housewares, souvenirs, and other goods, and bundle up (or find the PATH walkways) if you're visiting in winter, as temperatures drop to an average high of about 30 degrees Fahrenheit (minus 1 degree Celsius) from December through February. The Toronto Eaton Centre is a bright and airy shopping mall in the heart of Toronto's downtown that houses more than 230 stores—one of Canada's largest malls and, measured by visitors, consistently the city's biggest tourist attraction. The stores will appeal to the budget conscious and spendthrifts alike. The mall has undergone several renovations over the years since it opened in 1977. The Toronto Eaton Centre connects underground with the Toronto PATH network of shops and businesses, making it great for cold or rainy days. More than just a place to shop, the multi-level, glass-domed Toronto Eaton Centre is home to several excellent places to eat and features a huge mobile of a flock of Canadian geese, Flight Stop, designed by artist Michael Snow. The Yorkville neighborhood is a delightful anomaly in the midst of Toronto high-rises and shopping malls. Tucked into a pocket of downtown, the quaint Victorian architecture in Yorkville houses dozens of restaurants, boutiques, and art galleries. Bloor Street runs adjacent to Yorkville and features shopping that is upscale and includes high-end names like Holt Renfrew, Prada, Hermes, and Gucci. Winners is much like TJ Maxx and Filene's Basement in the U.S., selling designer labels at up to 60 percent off regular prices. Stores are large and a lot of sorting and searching is required, but the payoff is often worth it. In addition, Winners has locations throughout Toronto, making it an easy addition to any shopping trip you make. Canada's oldest corporation has several different store chains in Toronto and thousands across Canada. The flagship store is right across from the Toronto Eaton Centre. The Bay is a good old-fashioned department store, complete with everything from clothes to household items, and a place to have lunch. The Bay is particularly famous for its Hudson's Bay Blanket, sold for more than two centuries. The Bay also features a TOPSHOP women's clothing department from the popular U.K. retailer. Toronto has one of the largest Chinatown areas in North America. You will find bargains on exotic trinkets, jewelry, clothing, and household items. Plus, of course, where there's a bustling Chinatown, there's delicious food, and Toronto's Chinatown is no exception. There are numerous restaurants serving not just authentic Chinese, but also Vietnamese and other Asian fare. Chinatown runs along Spadina Avenue from King Street to College Street. Queen Street cuts east/west through Toronto and morphs from funky retro to chic shops and restaurants to antique shopping to The Beaches district at the far east end. Especially famous for attracting shoppers is Queen Street West (University Avenue to Spadina Avenue): Edgy, hip, and trendy all describe this area of Toronto that also boasts some of the best-known clubs and cafes. The Queen Street West area has, in fact, become so popular that the truly bohemian have moved even further west to what is now known as West Queen West (between Bathurst Street and Niagara Street). Kensington Market is a favorite area in Toronto. If you're someone who wants to get away from high-rises and department stores, Kensington Market offers a nice respite from the usual big commercial trappings. Adjacent to Chinatown, Kensington Market has a plethora of retro shops, cheap and used clothing stores, cool cafes, furniture shops, great restaurants, and a variety of ethnic and organic produce stores. 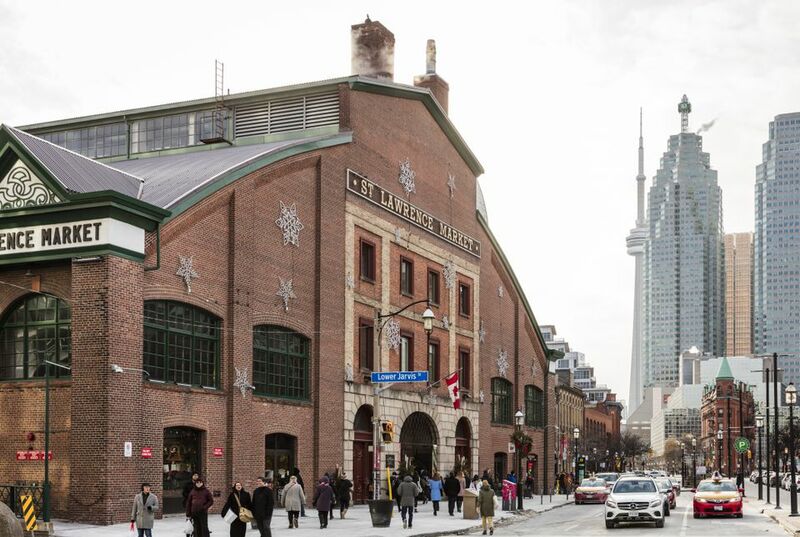 Close to downtown and central to the historic St. Lawrence neighborhood, St. Lawrence Market includes the South Market, which has over 50 mostly food specialty vendors and a gallery on the second floor, and the North Market, which carries on a tradition of over a century of hosting a Saturday Farmers' Market. On Sundays, more than 80 antique dealers fill the North Market building. Known as "Yonge and Eligible" due to the young professionals that frequent this area, Yonge and Eglinton is less pretentious than Bloor-Yorkville and offers cool, unique finds mixed with mainstream appeal. A mall and indoor shopping concourse are on the corner, or walk north on Yonge Street and peruse a variety of clothing, home decor, and bookstores. Buy yourself something pretty and head to one of the many area clubs and eateries to hang with the beautiful people. Yonge and Eglinton is about a 15-minute subway ride from Union Station or Eaton Centre on the Yonge-University line heading north. For your indoor shopping pleasure, the PATH is an underground system of over 19 miles of walkways mainly running parallel to Yonge Street and Bay Street. Lined with stores, restaurants, and services, the PATH's atmosphere may be lacking, but on days when the weather is crummy, it's a good way to stay toasty and dry. Foreign visitors flock to Vaughn Mills, one of the largest malls in Canada, located beside Canada's Wonderland. It has almost 1.3 million square feet (110,000 square meters) of retail space. Vaughn Mills is open 362 days a year, closing only on Good Friday, Easter Sunday, and Christmas Day. The Legoland Discovery Centre is an indoor family attraction located at the mall. Find good eats, culture, shopping and history on this walking tour of downtown Toronto.